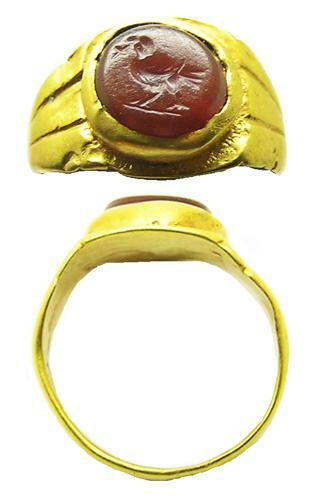 This is a charming example of an ancient Roman gold intaglio ring of a dove, dating to the 3rd century A.D. The finger ring can be categorized as Henig's (1978) Type VIII, dating from the second or third century AD. The finger ring is keeled in profile with a prominent oval bezel consisting of a dark red carnelian/sard intaglio encased within a box setting. Similar intaglio rings have been recorded DUR-721633 and BERK-B279D7. The intaglio is cut with a walking bird, holding a twig or leaf in its beak. This may represent Noah's dove returning with an olive leaf (Genesis 8:11 - And the dove came in to him in the evening; and, lo, in her mouth was an olive leaf pluckt off: so Noah knew that the waters were abated from off the earth) The dove and olive leaf used by early Christians as a symbol of Peace. St. Clement of Alexandria (Pied., III, c. xi) says that a Christian man might lawfully wear a ring on his little finger and that it should bear some religious emblem—a dove, or a fish, or an anchor. As such this ring most likely was intended for an early Christian, used to seal an authenticate letters and writings. Today it has survived in excellent condition, intact and wearable.